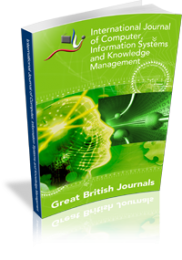 International Journal of Computer, Information Systems and Knowledge Management is a peer-reviewed journal published by the British Research Institute United Kingdom. International Journal of Computer, Information Systems and Knowledge Management welcomes research papers in Artificial Intelligence, Computer Architecture and Engineering, Computer Graphics and Visualisation, Software Engineering, Information Science, Computational Science, Computer Security and Cryptography, Semantic Web, Information Systems, Documentation Management, Human Computer Integration, Information Ethics, Knowledge Management, Personal Information Management, User Centre Design, Group Wise, Data Modelling, and other related areas. International Journal of Computer, Information Systems and Knowledge Management is published in both online and printed versions. To submit an article for consideration in this journal, please see our submissions page. Publication fee's are GPB £90 for Online Only or £100 with 2 Hard Copies included.